Here’s a visual of why we are in the BEST time of year. I mean… figs! Apples! Bourbon! CINNAMON SUGAR. It’s definitely cinnamon sugar season, right? In my secret brain it might always be cinnamon sugar season, but in my hold-it-together-for-the-rest-of-the-world brain, autumn starts cinnamon sugar season. Because it’s time to hibernate. Soooo. I have this huge, huge blog crush on Kayley of The Kitchen McCabe. 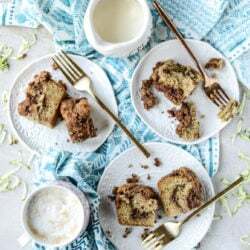 You might have noticed if you read Tuesday Things, but I just want to consume every single thing that she makes. And her photography is UNREAL. Unreal, I’m telling you. I adore her. She always makes the most creative shrubs and every time I see one, I swear I’m going to make my own ASAP. I’ve wanted to make a shrub at home for a few years (I kinda feel like it’s baby step towards making my own kombucha… haha) but have never got around to it. I figured this would be the perfect time since I’m losing my brain over apples! And I want every apple cocktail and mocktail under the sun in my life right now. What better way to start than with this shrub?! If you’re one of the people who is like, what, what the heck is a shrub and is she going to put greenery or landscaping in a cocktail, don’t fear. I am not. A shrub is essentially a fruit syrup made with vinegar instead of water. And, um, if you’ve been reading this blog for about five minutes (hello), I am in LOVE with all things vinegar. I realize that sounds odd, weird even… maybe a bit asinine. Eddie hates vinegar and the moment he smells it, runs away in disgust. I, on the other hand, prefer a touch of olive oil to a big spoonful of vinegar on a salad and freak over anything briney and pickled. Weirdo taste buds man! They’re a thing. The apple didn’t want to be lonely in that vinegar + sugar mixture, so I threw a handful of fresh mint into the bowl and it was one of the greatest decisions I’ve made this September. Since I threw in the towel and stopped watering my plants in anticipation of ripping most of them out and transferring some herbs inside, they’ve been growing like dang weeds. Sidebar: I’m totally going to do some fall planting this weekend! Even though I think mums are ugly. I want to be festive. Anyway, I have loads of mint, basil and sage, along with lemon balm, chives and lavender. A little extra rosemary too! I actually think any of those would be delicious with the apple, but mint… it was for me. Since I had bigger plans in mind. Bigger plans that included BOURBON. After the shrub mixture sat for about 48 hours, I mixed it with some maple syrup, bourbon, fresh figs and seltzer. The figs. Guys. The freaking FIGS. They were juicy and wonderful and so flavorful. I’m moving to figville. I love how “warm” this drink is, even though it’s cold. Even though it has a touch of refreshment from the mint. And it’s completely customizable, so I say you come on over and we can binge on a Gilmore Girls marathon and drown in fresh figs. YES. Place the apple and mint in a large bowl. Pour in the sugar and vinegar, stirring to combine. Wrap tightly with plastic wrap or place in a sealed container or jar and refrigerate for 24 to 48 hours. Remove from from the fridge and pour through a fine mesh sieve, using a spoon to press the fruit and release the extra liquid. To make the cocktail, rim the glass with cinnamon sugar, using some extra maple syrup on the rim. Fill the glass with crushed ice. Add the mint apple shrub and maple syrup, stirring. Pour in the bourbon and stir again. Add the sliced figs. Top with the seltzer water and serve! You can also use ginger ale or ginger beer. Whyyyy is this so delicious? These look amazing! I’ve never had a fig cocktail and I need to change that NOW. I want to come to figville too. Now that I know it’s a place, I want to live there. All my big plans include bourbon as well. Really. These gorgeous drinks are almost too pretty to drink! love the flavors you combined, YES! God Gracious, this is fantastic ! Perfect timing for perfect drink ! LOL! I never plant mums either because I don’t think they’re all that pretty! LOL. 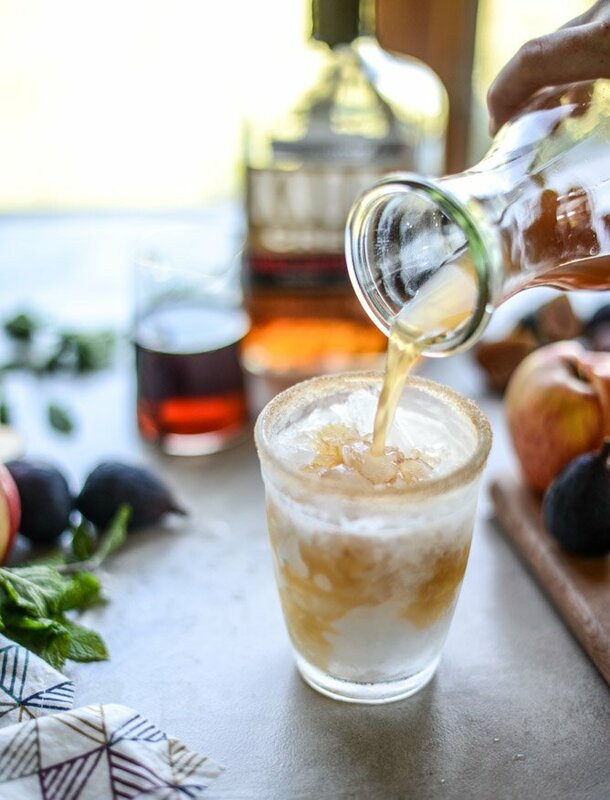 Love, love LOVE bourbon and apples, but never thought of drinking it (it’s in all my apple desserts! )… I LOVE THIS SHRUB, Jessica! Now, I just made my first shrub two weeks ago .. a blackberry shrub that was over the top! And I’m smitten with vinegar too… So this has got to go on the to-make list before figs are done for the season. Fabulous work my dear! (Kayley’s work.. omg! I know!). FIGS! My favorite fruit! Not gonna lie, shrubs sound WEIRD. But if it’s for a drink with Bourbon and figs, I’m willing to try anything! Oh my goodness. Girl. You just made my week! I’m so honored that you even follow me ☺️. And you tried a shrub!! I LOOVE the flavors here. Now I want to make this asap (you know how I love my shrubs ?)! Also, can I just say how much I love reading your posts?! You have the most entertaining writing style and I love it! “Secret brain”, haha ? Thanks for the love, Lady. ? Mmm YUM! 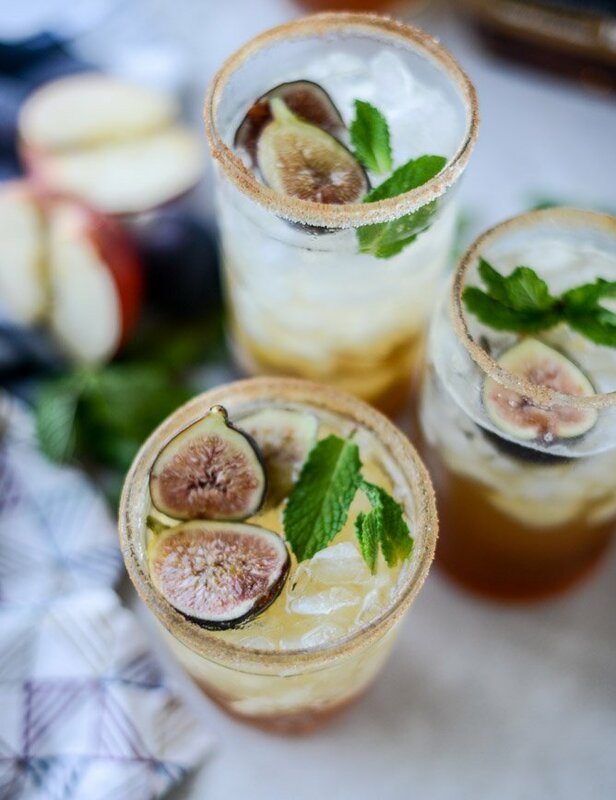 The figs in this cocktail are so gorgeous! What a fun celebration of the season. I’ve never even heard of a shrub… what is this magic?! But I do brew my own kombucha at home so this is totally up my alley. And figs, I mean, obviously. That looks amazing! I love anything with mint in it! I absolutely ADORE this! I am a huge fan of figs… and bourbon :) – and I was actually just trying to figure out how to combine the two in a drink last weekend. Problem solved! I didn’t know what a shrub was before this so thanks for filling me in. I was one second away from googling and then you saved me from my confusion right on time! hah. The figs really are a nice touch and I’m right there with you on the apple everything binge! Also – The Kitchen Mccabe really does have stunning photography. You had me at bourbon… But then Gilmore Girls!!!! Mingo Creek Craft Distillary in Washington Pa (on Maiden St across from the courthouse) has their bourbon release tomorrow at 11 a.m. Can’t wait to try it in this shrub! They have the most amaaaazing cocktails – if you’re nearby, it’s worth the trip! (Open Thursday, Friday, Saturday from 11-7). Mums are the worst. Lol. This cocktail is gorgeous and hello, I have the biggest girl crush on Kayley. Her work is incredible. I hope to have a fraction of the talent that she has. Cheers, friend! Looks delicious! You should totally try brewing kombucha- I’ve been making a couple gallons a week now and it is so much fun to try all the different flavors and getting it delightfully fizzy. I would love to see the flavors you come up with. It’s also fun to gross people out with the scoby lol. And so cheap to brew! i get Paid Over £80 per hour working from home with 2 kids at house. I never thought I would be able to do it but my best friend earns over £9186 a month doing tthis and she convinced me to try. The potential with this is endless…..
Hi there. This looks amazing! We are trying to come up with a signature drink for a groom for a fall wedding and this may just be the ticket!!. One question. Once the shrub has sat for 48 hours, do you strain off the liquid and discard the apples, etc and only use the syrup in the drink? I am not sure by the recipe if you add in the fruit or only use the syrup.